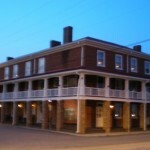 Since 1981, the Craig County Historical Society has restored and maintained the Old Brick Hotel in New Castle. Past boarders include lawyers and judges, hot springs visitors, and maybe Jesse James. The three-story brick building was built in three stages beginning in 1840. Right across the street from the Craig County Courthouse, it was the center of town through the boom times of the early 1900’s. The Hotel now showcases local antiques, a genealogy library and a lot of history. The dining room can be rented for meetings and dinners. Two restored log cabins are nearby; the Hawkins cabin is adjacent to the hotel and the two-story Keffer log house is next door to Food Country USA. 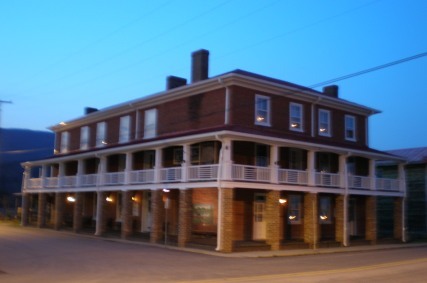 The Old Brick Hotel is the proud focal point of the Craig County Fall Festival second Saturday of each October. In Sept. 2012, we moved file cabinets and books DOWN STAIRS into the new Genealogy Library, paid for largely by member donations. Entrance is from Main Street across from the Health Dept. or thru the interior hallway. Thanks to Opal and Glen for all their hardwork!